Ken Auto is pleased to share with you this special made Mazda Roadster Towel. With the all the different types of Mazda Roadster that you may have. The towel is made with the design of silhouette, the size of the towel is 34 cm × 85cm the fabric is of the highest quality the selling price is 1200 yen. Ken Auto has taken the light distribution design base on the specifications of the halogen bulb, and we have adopted the XM-L2 from the CREE Company in the state of the art technology. The bulb is designed to keep the lumen low and we have achieved this high Candela. We try the car at the car inspection and pass the inspection test without no problem. In the case of the NA, we attached the controller to the cover of the inside of the retries side or you can attach it to the engine room side. The biggest characteristic of the LED light is that it is doing all of the heating in the heat sink, and for the valve of the design, the LED light does not use the fan cooling mechanism, I avoid the structure that you are using a complex cooling fan and thought that to take advantage for a longer usage life of the bulb, which is one of the main feature of the LED bulb. It is as simple as possible of the operation part, the point of reducing the parts to be exhausted, the durability of this product is it has become an important element for keeping the life span of the bulb. 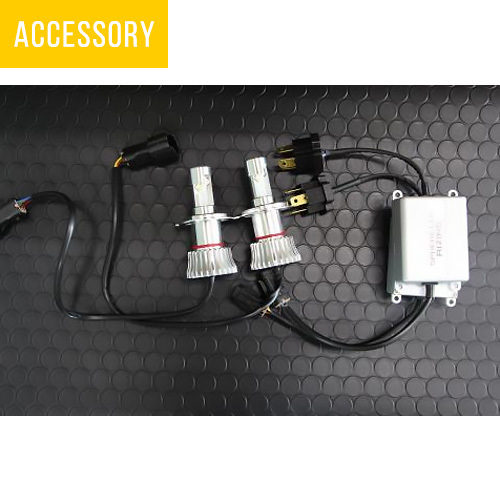 The LED light, electricity consumes as low as 20W, so the startup voltage is around 7V, it is possible to attach without any compatibility problems even in the Roadster. The LED have 30000 hours of life expectance and you get a two year warranty, the LED is made in Japan with the highest stander. Ken Auto injects the know-how of motor sports and strengthens the rear body rigidity of the Miata・MX-5（Roadster）! I control torsion and the distortion of the body, and the effeteness is to regain suspension original accurate movement is distinguished with the use of the DOSUKOI. For more information please visit our website. For all Mazda Miata fans, Ken Auto Japan has made 40 new LINE stamp for the Mazda Miata fans around the world. The LINE stamps are very interactive and each stamp portrays massage and tells what emotions that you feel. You can access the stamps through the QR code that’s posted at the bottom of the page. I do hope that you will enjoy these Mazda Miata stamps. Please share with your friends. MX-5 Dovetail door latch parts, Ken Auto original rigidity. The dovetail door latch is called “Taikan” it is possible to feel the body “experience”, analogy that’s with the human, we are subjected to a “trunk” of the trunk training that has become commonplace. The dovetail door latch part is referred to as “Taikan”, it also means “experience can be. “It is the “human trunk” part which it is very difficult to forge in human beings, and is quiet, but thinks whether it is in transverses abdominal muscle and stomach bias line when I compare this dovetail door latch part “Taikan” to human muscle. The dovetail door latch part “Taikan” installation position. It is the monologue of the roadster with the highest stiffness for exclusive use of a convertible consisting of the floor tunnel in addition to the side sill of right and left, but the human trunk part of the body to add it to this side sill rigidity, and to constitute with dovetail door latch parts “Taikan + door panel” bends and it is powerful and will support the load and twist lid. • Steering response will get much better. • You will feel a firm feeling that comes through from the sheet. • You will begin to understand the difference in the movement of the foot circumference. • The sound quality of the door speakers will improve and you will get much better sound quality. • The deflection from the shock will improve on the road surface and when you drive over the manholes you will not get the vibrating sound. The dovetail door latch parts “Taikan” will improve the overall feeling of your MX-5. ※The commodity price contains a cushioning material fee and packing fee.